If you own a commercial property featuring as little as 10,000 square feet of floor space in a larger, progressive-minded city, chances are you'll be subject to an energy benchmarking mandate at some point in the near-term future. If your holdings are concentrated in smaller Red State cities, benchmarking probably won't be a matter of law any time soon. But you might consider it anyway. While compliance with new commercial building benchmarking ordinances taking effect from New York to San Francisco will require a bit of effort from many small-cap property owners, the programs also stand to boost fortunes of owners able to demonstrate superior energy efficiency. Those cities along with other early adopters including Washington, DC, Seattle, Philadelphia, Minneapolis and Austin are aiming to reduce aggregate building-sourced greenhouse-gas emissions by requiring most commercial property owners to disclose energy-efficiency ratings - at least to certain key market-driving parties. Most of the city programs in fact mandate public disclosure of efficiency benchmarks - specifically data generating the Environmental Protection Agency's Energy Star rating, which gives each property a rating on a scale of 100 based on performance relative to similarly configured (and contexted) properties across the country. Indeed, all the aforementioned programs except Seattle and Austin mandate public disclosure. The former requires disclosure to existing and prospective tenants as well as would-be buyers and lenders; the latter just to buyers. Statewide programs launched in Washington and California also require disclosure to prospective tenants, buyers and lenders. As additional municipal programs come on line, the trend will likely be toward full public disclosure, rather than limited to the narrower property stakeholders, says Jessica Lawrence, who oversees building-energy performance policy activities at the Institute for Market Transformation. Devisers of the newest programs in Philadelphia and Minneapolis opted for full disclosure, and Boston is leaning in that direction with its proposal, added Lawrence, who with IMT associates and other parties consults jurisdictions interested in benchmarking matters. Other cities currently debating programs include Chicago, Portland, Cambridge and Boulder. State pilots are under way in Illinois and Massachusetts, with consideration occurring in Connecticut, Colorado, Maryland, Michigan, New Mexico, Oregon, Tennessee and Vermont. While other program particulars vary as well - including minimum building-size thresholds (more on this below) - their key common denominator is the Energy Star-affiliated benchmarking tool known as Portfolio Manager. It's already a highly popular benchmarking tool that's pretty simple to implement - essentially providing all relevant utility consumption data to EPA's Portfolio Manager team, which crunches it into an Energy Star rating (and related report data) relative to comparable properties. 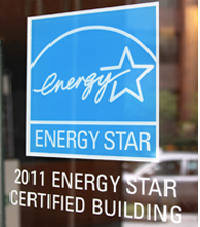 Ratings of 75 and higher earn the Energy Star label. And Portfolio Manger will be getting a noteworthy version upgrade that will be even easier and more effective within the next few months, Lawrence adds. Again, the new city and state mandates reflect the expectation that if the vast bulk of a marketplace's competing properties are subject to the same benchmark, the corresponding market impacts will ultimately lead to less energy consumption and GHG emissions. The underlying theory is that if interested tenants and investors are aware of each property's efficiency rating, competitive forces unleashed by this heightened market transparency will motivate owners to retrofit and otherwise improve energy performance. In other words, properties that require less grid-sourced energy will not only inherently be more environmentally friendly than the less-efficient competition - with mandatory benchmarking disclosure, they'll also command higher rents and, in turn, valuations. And it's hard to argue that's not a reasonable, sound hypothesis. Of course all regulations entail at least some cost for participating buildings. And perhaps the most meaningful distinction among the new benchmarking mandates - at least to MarketBeat readers - is the varying minimum building-size thresholds. As Lawrence explains, the challenge for administrators is to make sure mandates cover a sufficient portion of the marketplace to affect competition - while sidestepping in particular any sizable burdens on small-cap CRE landlords. And starting with just larger properties, then phasing in smaller ones, should help smooth the way as new programs launch, she adds. New York, DC, Philadelphia and Minneapolis all opted for the 50,000-square-foot threshold - with the DC and New York mandates covering residential properties. San Francisco started at 50,000 (for 2011 data) and is adding the 10,000-to-49,999 set as 2012 data disclosure comes due. Seattle administrators have struggled setting the threshold: initially aiming to phase in the 10,000-foot minimum after requiring 2011 data from buildings of 50,000 feet or more. However based on feedback, and the conclusion that including buildings smaller than 20,000 feet might entail more effort than corresponding benefits would warrant, the minimum for 2012 data was re-set at 20,000 (multifamily properties included). Consideration of further phasing there continues. Austin will phase in a 10,000-foot threshold (and apartment complexes of five or more units) - but again, only disclosure to prospective buyers, plus the electric utility, is mandatory. And the new statewide mandates (with disclosure just to the key stakeholders) extend to non-residential properties as small as 5,000 feet in California and 10,000 in Washington. Small-cap property owners typically don't have the luxury to assign compliance responsibilities to an IT or sustainability staffer - and hence will probably end up spending several hours or perhaps an entire business day setting up on Portfolio Manager if they haven't already, Lawrence acknowledges. And depending on program particulars, a landlord with just a handful or fewer tenants might have to spend additional time securing data releases from tenants if a property doesn't meet a utility's meter minimum for building-wide data. But generally speaking, compliance in many cases is going to be less time-consuming for smaller properties with few tenants, compared to large multi-tenant properties, Lawrence adds. More importantly, she stresses, participation in Energy Star/Portfolio Manager can provide meaningful benefits to owners not covered by mandates, as a strong score can clearly aid in competition for tenants. It's also a great tool for helping plan cost-effective upgrades tailored to small-cap properties such as lighting, HVAC fine-tuning or replacement, cool roofs - she also recommends new-wave green leases that pass some of the retrofit costs on to benefiting tenants. While the new benchmarking ordinances also specify fines for non-compliance - predictably smaller for properties under 50,000 feet - Lawrence says uncooperative landlords will more likely receive notices instead, followed by more official warnings, at least in the early years. "The aim isn't to fine anyone; it's just to get everyone into the fold."